Come on Greg we need more than that, congrats on the speeks. Been too busy listening to tunes to say much else Andy! 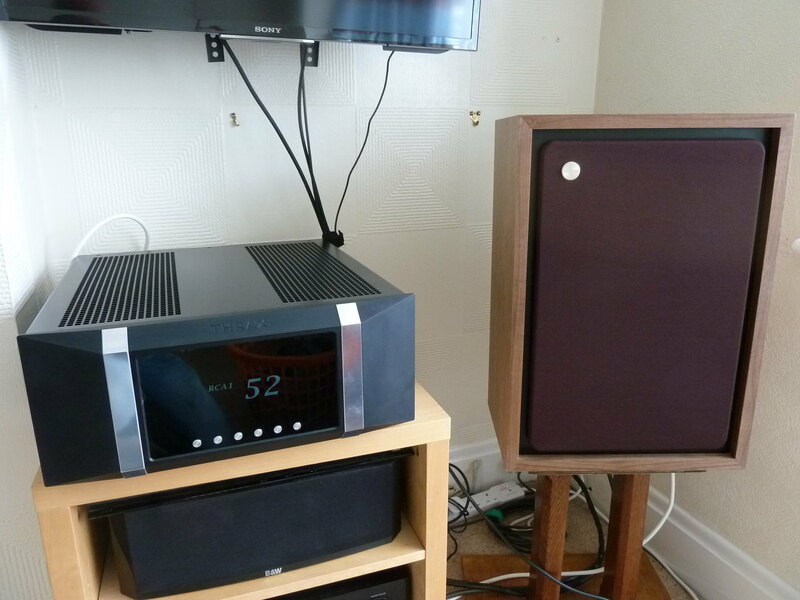 Moving from the bookshelf-sized Harbeths to the whacking-great Tannoys is a bit of an unfair comparison for the Harbs in some ways as the very obvious increase in bass extension and weight is a quite overwhelming improvement. Tied into that is the fairly dramatic increase in the sense of scale and physical drama of music played on the larger speaker. The suggestion of bass depth I had on the P3 has been replaced by genuine deep punchy bass with quite surprising wallop! But that's what you'd expect. The Tannoys also present a wide panoramic vista of a soundscape in front of me, which gives a more dramatic presentation to some music. My recent discovery of electronic music really benefits from this quality. Seems like another world opens up in front of you. I'd imagine Harbeth M40.1 would do something similar. I played some live small-group Jazz last night and on a very familiar Chet Baker Trio CD, Chet's vocals were quite obviously different in presentation from the P3 sound I'm used to. It wasn't a clumsy colouration that the Tannoys imparted, but a subtle kind of expressive silkyness that made for a very inviting listening experience. I'm tempted to say it sounded more luxurious through the Tannoy Kensingtons. Was very excited to read this as have just bought a legacy ARDEN which gets delivered today .... and my Leben CS300xs will migrate into the large lounge .... was planning on using the existing Croft 25R / ATC p1 power (currently with harbeth 30.1) but will try both out and then decide which amplification route is best. And then whether to sell ... what to sell. I used to own the original Ardens and they worked well with a croft OTL3, but they excelled with 200wpc Luxkit Z504 !! Well speakers arrived today on a crate - luckily had pal at mine to help carry each 50kg box up 1.5 flights. Setup toed in to just in front of nose on sofa and been playing music for last 5 hours. If it wasn't for women, all speaker would be big. pink floyd money - heard the chatter and clarity of effects better than ever before . tried more modern tracks like James Blake ‘wilhelm scream’ this has a dense driving bass with sharp percussion but the Croft ATC revealed everything and here the Leben seemed to cloud the bass a bit more and seem unable to reveal as much detail .... Leben was a bit fatty on bass if that makes sense. so Leben back to small lounge where it powers falcon LS3/5a speakers and here the presentation just work with the confines of near field listening and lack of bass extension.